This year marks the 200th birthday of Louisiana, and what better way to celebrate than with the greatest cake in Louisiana? They truly make great birthday cakes, my friends had one special ordered for my 18th birthday. The best king cake in all of Louisiana is most definitely from Julie Anne's in Shreveport. Sorry, south Louisiana peeps, no Gambinos for me, I'm a little biased. My favorite one they make is filled with pralines and cream cheese. 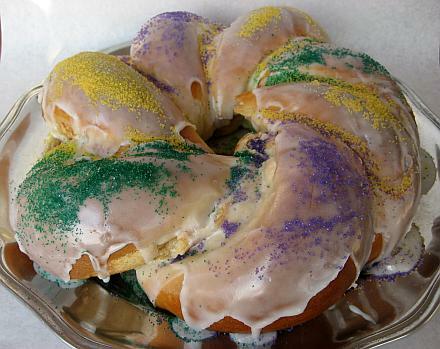 "Traditional" king cakes don't have any filling, and that's terribly boring. 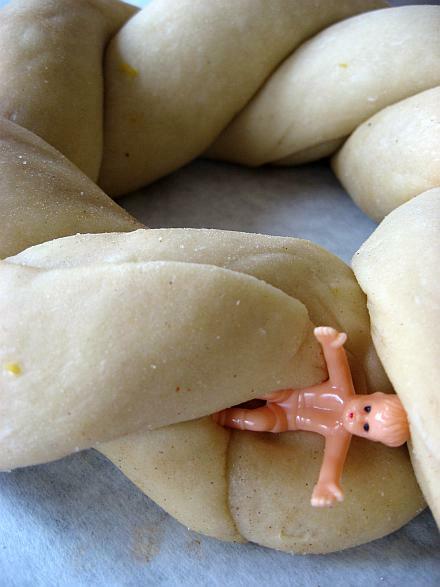 The rule is whoever finds the little plastic baby Jesus has to buy the king cake next year. Honestly, in all my years of king caking, no one has ever kept up with that. It's just fun to find a little plastic child inside your cake? I was planning on making a homemade king cake this weekend and blogging a how-to, but due to a severe overdose on king cake this past month, I couldn't work up the courage (or insulin) to do it. Since today is Fat Tuesday, you better make it live up to its name! Too soon for diabetes jokes? Melt the butter in the microwave in a medium mixing bowl. Add the evaporated milk, 3/4 cup of the sugar, and the salt. Stir so that the sugar dissolves. Allow to cool. Dissolve the yeast in 1/4 cup lukewarm water and stir in the remaining teaspoon sugar. Allow to stand for 5 minutes, until foamy. Add the yeast mixture to the butter and milk mixture. Add the eggs, nutmeg and lemon zest and whisk together vigorously, until well blended. Then switch to a wooden spoon and continue adding flour and mixing well. Do not add more than 6 cups flour, or your cake will be too dense. When you have added all the flour, turn the dough out onto a lightly floured wooden board and knead it with your hands, which you have dusted with flour, until the dough is smooth and elastic, about a dozen turns. Place the dough into a large bowl cooking spray. Turn the dough to coat all sides with spray. Cover the bowl with a tea towel and allow the dough to rise in a warm place until doubled, about 1 hour. Combine the sugar and cinnamon in a small dish and stir well. Punch the dough down and divide the dough in two. Roll out each half into a 10 by 15 inch rectangle. Brush each rectangle with half of the melted butter and then sprinkle each rectangle with half of the cinnamon-sugar filling mixture. Roll up along the long end like a jelly roll. Press the roll together at the seam, sealing with water if necessary. Wind the two rolls together, forming one thick piece. 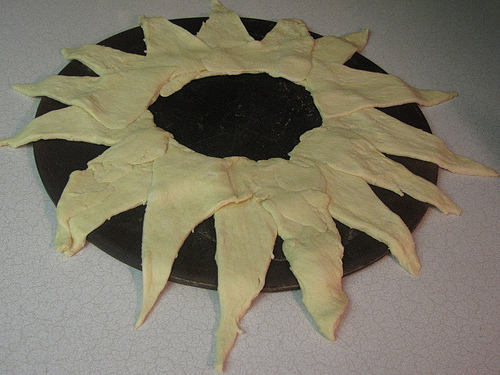 On a baking sheet sprayed with vegetable oil cooking spray, form the dough into a circle and seal the ends together. Cover with a tea towel and allow the cake to rise in a warm place for about 1 hour, until it almost doubles in size. Don’t forget to hide your baby Jesus! Whisk the egg white with 1 tablespoon water. Brush the top of the cake with the egg white. Bake the cake for 35 minutes, until it is browned and sounds hollow when tapped. Combine the sugar and milk in a small dish and whisk until smooth. If the mixture seems too thin, add a little more sugar. If it won’t drizzle, add a little more milk, 1/2 teaspoon at a time. Allow the cake to cool for a few minutes on a wire rack. Drizzle with icing and sprinkle the colored sugar in random patterns over the white icing. If you wanna skip all the dough difficulties, you can always use crescent rolls for the dough stuffed with a cream cheese/pie filling combo. Complements of mom, the former Pampered Chef. Trish and I have big plans to get super fat for dinner tonight. Cokes, sweets, and fried food. Is anyone else out there giving up something for lent? 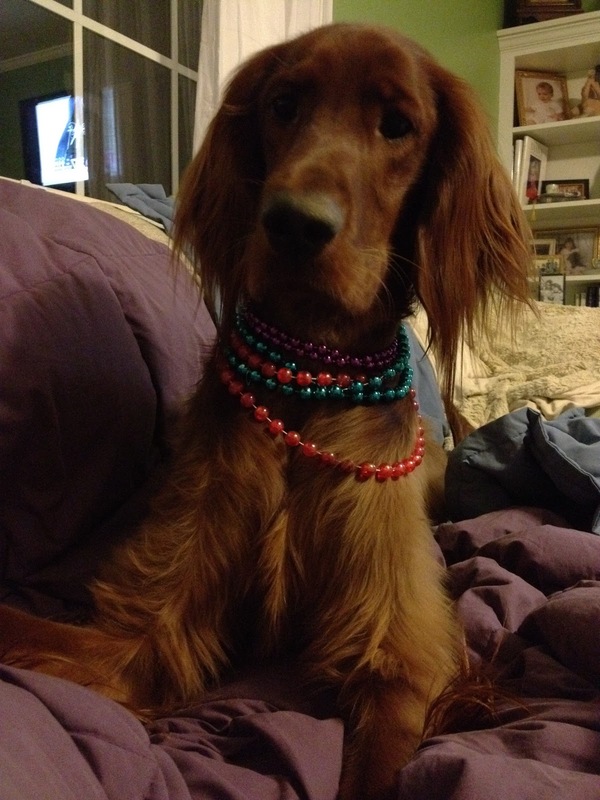 Happy Fat Tuesday, from Sir Charles! oh. my. gosh. that cake looks amazing! i need to try king cake! in honor of fat tuesday, i think i will have a hamburger, fries, AND a milkshake tonight. oh and i must not forget about the cookie that was almost as large as my face... that was my "afternoon snack" :) happy fat tuesday dear! bring on the food babies! i cannot believe your cake! how wild! a baby jesus!!! love it. i think i missed the boat on fat tuesday this year. a shame. i'm so glad you commented on my blog because that means I got to see yours! That cake looks delicious. Do you guys live in Louisiana? My husbands family lives there & man we love it there! :) I'm following now! oh no! it's such a great holiday! haha, i guess you could technically make any day a "fat" day, i kinda like that idea! yayyyy thank ya thank ya (again!) can't wait to do it!